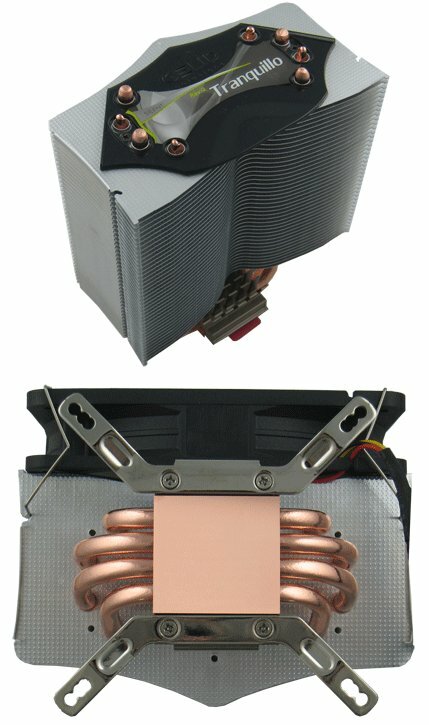 Gelid announced the Rev.2 Tranquillo, a new processor cooler with four copper heatpipes, a copper base, aluminium fins and a 120mm PWM fan that delivers up to 58CFM at a noise level of 25.5dBA. It measures 74mm x 125mm x 153mm (L x W x H) and weighs 645g. The Rev. 2 Tranquillo is compatible with the Intel Socket 775, 1366, 1155 and 1156 and AMD Socket AM2/ AM2+/ AM3 processors. Pricing is $40 (30EUR). GELID Solutions brings the Tranquillo to the next level. As with the previous edition the Rev. 2 Tranquillo uses 4 power heat pipes and a unique heat pipe constellation to achieve the best in class heat transfer from the CPU core to the aluminum fins. The heat pipe constellation was further optimized to prevent any conflict from any components on the latest mainboards. The new AMD clip enables to install the cooler in four directions (4x90°). Additionally the smaller heat sink was created in a new shape to provide better heat transfer. Both heat sinks were created by using precise software simulation and calculation during the development stage to lower air flow resistance as much as possible. A silent 120mm fan with the intelligent GELID PWM (Pulse Width Module) control was chosen to compliment the heat sink. The fan blades were optimized to guarantee high airflow while running silently. The intelligent GELID PWM curve keeps the fan silent when no necessary cooling is needed and accelerates the fan speed whenever additional cooling is necessary. The multi-award winning high performance GC-2 thermal compound is already included in the package. Additionally mounting clips for AMD AM2, AM2+, AM3, AM3+ and for Intel 775, 1366 and latest 1155 &1156 sockets as same as back plates for Intel LGA 775, Core i3,Core i5 and Core i7 boards are all included. “If you are looking to build an AMD system the new mounting solution will allow you to position the CPU cooler in whichever direction gives you the optimal thermal solution“ said Gebhard Scherrer co- founder and Sales Director of GELID Solutions Ltd.